MakerBot announced today a new product called the MakerBot Digitizer. The Digitizer combines laser and camera sensor input to scan an item on a rotating platform. 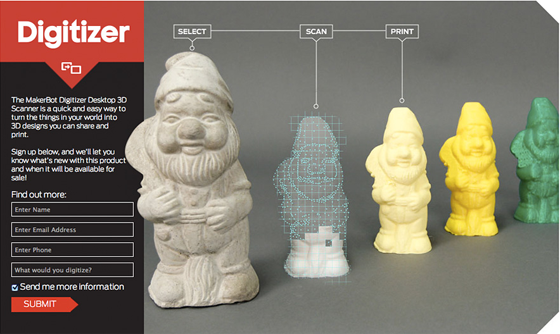 The 3d model of the scan can then be 3d printed on a Makerbot or any other 3d printer. Scans take about 3 minutes and the Digitizer can scan objects up to 8 inches cubed – slightly larger than the build size of a standard Makerbot Replicator. There have been open source projects for digitizing in a manner very similar to the Makerbot Digitizer, and Kickstarter projects for 3d Scanning solutions that have used David-Laserscanner software. But the setup costs for these systems is typically around $500-2500. The demo Makerbot showed off doesn’t use a costly projector, instead relying on a laser and camera setup, so they will likely be around the lower end of that price range. Depending on the quality of the camera, they could have an extremely inexpensive way for people to create 3d scans easily. There is no solid pricing information yet on the Digitizer, as it’s planned to be sold starting later this year. Just as 3d Systems is attempting to dominate at the commercial and professional level, Makerbot has been opening up the 3d creation market for hobbyists and home use, and this product shows they want to be able to supply the entire 3d printing ecosystem.